(Published June 29, 2012) We are prone to overstatement. Everything is bigger than the biggest, better than the best, faster than the fastest. It sells. But it also blurs reality, and confuses things when the oh-my-God stuff really does happen. On Thursday, it really did happen. 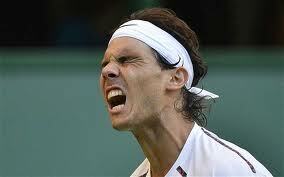 Rafael Nadal lost in the second round of Wimbledon. Who did he lose to? That’s what someone asked me a few minutes after it was over, a few minutes after I had watched every single point of that match for hours. The answer: Um, uh. Can’t remember. Some guy with the same number of letters in his name as Nadal. Some guy turned out to be Lukas Rosol, a 26-year-old from the Czech Republic who had never done anything before. He has lost more matches in his career than he has won. And he beat Nadal 6-7 (11-9), 6-4, 6-4, 2-6, 6-4. It was the biggest upset in the history of tennis.